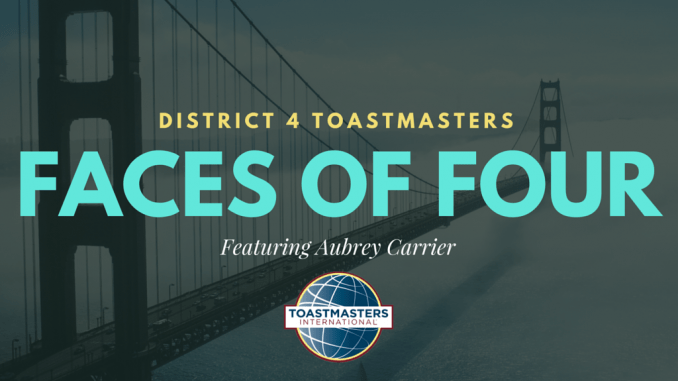 The Faces of Four interview series aims to showcase the stories and journeys of District 4 Toastmasters. The first spotlight of the 2016-2017 term is none other than our new District 4 Director, Aubrey Carrier. Let’s take a moment to get to know Aubrey. 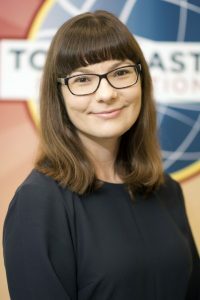 1) Tell us a little about your Toastmasters career (e.g. How long have you been with the organization, what clubs do you belong to, what made you join, etc.). I knew that my employer sponsored multiple Toastmasters clubs. Occasionally, I would see an internal bulletin promoting the program. The thought would cross my mind that maybe I should go check it out, but I always found a reason to put it off. In summer 2010, two colleagues dared me to speak at a professional conference the following year. I knew I needed practice speaking in front of an audience! Even with a looming deadline as motivation, it still took me a few months to seek out Toastmasters. I finally worked up the courage to visit that December and officially became a member in January 2011. If I could do it all over again… I would have joined a few years earlier! I still belong to my home club, Stagecoach Speakers-525 Market. But after realizing what a thriving Toastmasters community we have in District 4, it’s hard to stop at just one club! I’ve been a member of the advanced club Evening Stars since 2013, and earlier this year I joined the specialty club Point of Order. 2) How has Toastmasters helped you in your professional career? Several months after joining, a coworker observed that I was speaking up more in meetings. I started to realize that Toastmasters had unexpected benefits beyond delivering prepared speeches. Active participation offers us countless opportunities to compose mini-speeches and presentations on the fly, whether they are Table Topics responses, evaluations or functionary reports. Now I find that I’m able to present my ideas with better confidence and fluidity in conversations, meetings and other “off the cuff” situations. 3) What is the best public speaking advice you’ve ever received? Make sure your message is relevant and meaningful to your audience. 4) What has surprised you the most about yourself since you joined Toastmasters? 5) What are your interests and hobbies outside of Toastmasters? I’m a big fan of live performance, from blockbuster musicals to experimental plays in tiny shoebox theaters – the Bay Area has it all and everything in-between. I’m also a proud member of PFLAG-San Francisco and served on the board for two years. 6) How would you describe the perfect meal? One that starts with dessert, preferably involving ice cream of some kind. 7) What is a fun fact most people don’t know about you? I have a hidden, or sometimes not-so-hidden, theatrical streak (see answer to #5!). As a teenager I was involved in community theater. Now I find opportunities in Toastmasters to express that side of myself! What would you like to ask Aubrey? Please feel free to leave a question for her below. A new day… a new year… a new District 4! Aubrey, you mentioned that your colleagues have taken notice of your increased participation in meetings. Have they also commented on the fact that you are a polished speaker? I would imagine you must be pretty revered in your organization now. Thanks, Eugene. It’s a continual improvement process but I feel I’ve surprised a lot of people, in a good way! I warmly invite you, and excitedly challenge you to come to a Wed evening meeting at SF Mandarin/English Toastmasters and give one of your powerful, meaningful talk to a bilingual audience, perhaps sharing your thoughts on bi-cultural or multi-cultural leadership?